food makes me happy! :p-: Current updates and Mabel's 23rd birthday celebration! Current updates and Mabel's 23rd birthday celebration! 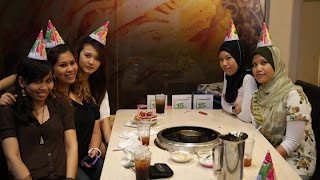 not to forget, the bestie's 23rd birthday celebration at Seoul Garden! Happy 23rd birthday Mabel aka my bestie!!! May your life be filled with happiness always alrite!! simple yet complicated,addicted to delicious food.Can't live without spicy food, big bang, my family & friends.